Cruises International announced the return of the Seabourn Sojurn cruise to Alaska at a lunch at the LIFE Grand Café in the V&A Waterfront on the 19 January. 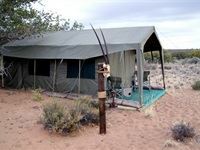 Sanbona Wildlife Reserve's Explorer Camp offers adventurous guests an authentic walking safari experience to explore the dramatic landscapes of the Karoo on foot. Click here to read all about our unforgettable experience.